I dont normally post iphone outfits on the blog and we forgot to take proper photos of this last night - but I really wanted to share this outfit with you guys incase you missed it on my Instagram. I went to a party at my friends Mandy and Bings and the theme was suits/pj's. The first part of the night we had to wear some sort of formal/dressy outfit then the second we changed into PJ's. I didn't change into pj's instead just wearing my new pink princess dress from Topshop. I saw the dress online and really really wanted it. It's really 80's and kinda weird in a prom dress sort of way but there was something about it that I knew it would really work on me. Fitting in the right places, the perfect shade and very flattering. I had so many compliments on it I was a very happy girl last night. Or that might have been the Jack Daniels going to my head! This is such a gorgeous colour!! I love that hot-pink on you! That has to be my favorite color for dresses! Such a jaw-dropping head-turning number! This colour is so gorgeous on you lily! This dress is wonderful, I love it!! Your dress is very pretty and chic. Love the colour. Love the shoes too! Such a cute, girly dress!! I love that it is such a simple dress, but it is also so stunning! I think I would live in that dress if it were mine. 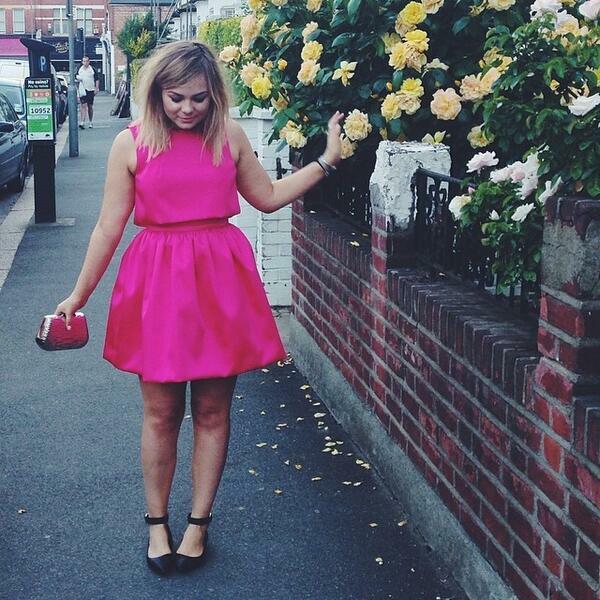 Love this dress- sometimes you just need an explosion of pretty pink girly-ness and you look super cute! You look so lovely, the colour and shape of the dress really suits you :). it's a gorgeous colour and looks fab on you, reminds me of crops and skirts that are a pair love the look ! Love your dress, wish i had one like that! the hot pink suits you soooo good. i just love the dress itself because it is formal but fun at the same time. Wow! Loving the pop of bright pink :) super cute dress! OMG, this dress is so adorable! Such a pretty dress! Looks so lovely on you. Love your dress! Such a fantastic colour on you! this color looks great on you!! I think pink cocktail dresses are perfect for every day and night party. I would definitely buy one for myself and also recommend to my buddies.